Jose Cortés is a 'bailaor gaditano' born and bred in Cádiz. He trained at the Conservatorio Profesional de Cádiz, the Pilar Ogalla and Charo Cruz dance schools and has taken advance courses with Javier Latorre, Juan Ogalla and Mercedes Ruiz. In 2003 he was winner of the esteemed national Alegrías competition at the famous Peña de Perla in Cádiz whilst only 16, his outstanding talent already spotted aged 11 in 1998, when he was a finalist in the TV talent programme 'Veo Veo.' Not only has he performed in several distinguished Flamenco dance companies, including that of Manolo Carrasco, he has also performed in several music theatre productions such as Anderson, Jesus Christ Superstar and Mowgli, in which he played the leading role. He has danced in several music videos for Vale music and made numerous appearances in a well-loved TV series on Canal Sur television. Carmen 'La Tico', also from Cádiz, has recently been singing with 'Flamenco en Route' and the Carmen Mota dance company, having spent several seasons honing her craft at the famous Tablao Flamenco Cordobes in Barcelona and the Tablao El Flamenco in Osaka, Japan. She is currently working with the Maria Jose Franco dance company. Juan Francisco Rodríguez Rubio 'El Cañejo' (or El Kañejo) was born in the fishing village of Barbate. He started singing from a young age, influenced by his grandmother who sang from the day he was born. He is a professional tuna fisherman by trade in the 'Almadraba', when the tuna migrate from the Atlantic to the Mediterranean but his passion has always been singing Flamenco. Through his appearances in local bars and Peñas, at communions, weddings and Ferias, his popularity has grown and he now sings at top venues worldwide. He always returns to life as a fisherman where his memorable voice can regularly be heard back at his local haunts. Mari Angeles Pérez Román is a true 'flamenca gaditana' who has studied with some of the best teachers, including Antonio Canales and Javier Latorre, after her formal education at el Conservatorio Profesional de Danza in Cádiz, as well as gaining invaluable experience working alongside Eva Yerbabuena, Mario Mayo, Israel Galván, Yolanda Heredia and Alejandro Granados. She was 'el pregón' of the Cádiz Carnival (i.e led the opening ceremony) for three consecutive years and has appeared in many Tablaos in Barcelona, Madrid and Cádiz and has also toured abroad to France, Morrocco and China. In 2009 she was the only dancer to hold a doctorate in Flamenco from the University of Seville which led to her influential role judging the prestigious national Flamenco dance competition, held annually at La Perla de Cádiz. She now teaches in Cádiz and performs regularly in her native province. Cuffy Cuthbertson, originally from Glasgow, began playing guitar from an early age and when Flamenco entered his life, it soon took over! He studied under Tito Heredia, Paco Serrano and Gerardo Nuñez and has acquired an extraordinary level of technique. He tours internationally with singer Yasmin Levy as well as playing with his band 'Flamenco Loco' around the South West UK. He also teaches Flamenco guitar in Bristol. Jaime Cantera (Jimi Can) is a Bristol-based Spanish-Cuban multi talented performer. He writes songs, plays guitar, percussion and more, absorbing influences from different world music styles such as afro, latin, gypsy, reggae or pop. For the last few years he has been developing his gift for the cante (Flamenco song) delivering an authentic and passionate response to the letras (words) and music and is a leading member of the band 'Flamenco Loco'. Kostka Garcia, originally from Northern Spain but now living in South West UK, developed his interest in Flamenco playing with Cuffy Cuthbertson in 'Calima,' a Bristol Flamenco ensemble in the nineties and has since been a regular collaborator in the band 'Flamenco Loco' sharing vocals and percussion with Jaime Cantera. Kostka is also a Rockschool examiner and guitar and percussion tutor. Suntou Susso is a talented West African Kora player and percussionist currently based in the U.K. who adds a vibrant flavour of Flamenco's early african influence. Originally from Gambia, he studied at the University of Music and Performing Arts in London and now performs and gives masterclasses all over the world. Adrián Brenes is one of the rising stars of Flamenco. Born in Conil, Cadiz, he began dancing at eight, studying with the famous 'La Truco' when she lived in Barbate and has since trained with some of the most famous names, winning numerous awards for Alegrías and Sevillanas along the way. He is the author of a unique individual style in which the assertive energy of the male dance (traditionally focused on the legs and feet) is channelled through the entire body, creating a joyous explosion of passion and charisma. He has worked as a professional Flamenco dancer since 2012. Adrián is now based in Madrid where his reputation continues to grow, with performances at Casa Patas and other famous venues. He has forged strong links with the UK, dancing with Flamenco Express (London), Alba Flamenca (Edinburgh) and was the leading artist in Flamenke's opening festival (Cheltenham, Stroud and Bristol) in November 2016. In September 2015, he spent a season with the London Royal Opera, Covent Garden in their production of Carmen and in June 2016, performed and taught at various venues around Mexico City. Adrián is a skilled and sensitive teacher with considerable experience. He speaks fluent english and has taught in London, Scotland, Gloucestershire and South Wales. When not performing, he teaches Flamenco at the Instituto La Truco in Madrid. Born in the Flamenco heartland of San Fernando, Marisa is an all-round performer who can dance as well as she sings. She trained at the Seville Dance Conservatory and has taken classes with some of the best flamenco dancers over the past twenty years. She now combines singing with dance teaching and is recognised as one of Flamenco's most capable and original female singers with appearances all over Spain. Maria was born in Cadiz in 1989 and began dancing at five. She later became part of the Paca Briceño Folk Dance Ballet, appearing in many national and international festivals. At sixteen, she entered the Conservatorio Maribel Gallardo in Cadiz as a full-time student of Flamenco, before gaining a Master of Music degree at the University of Madrid. 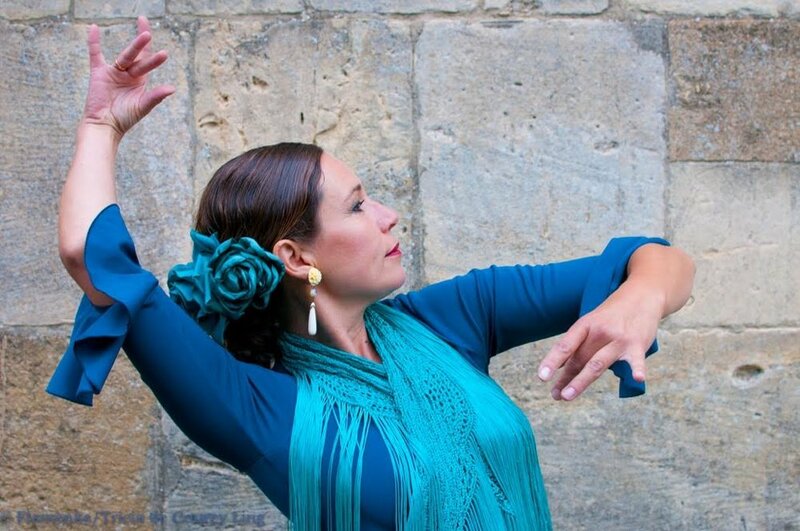 Maria has danced and choreographed numerous Flamenco shows in Spain and abroad and recently produced two Flamenco shows specifically for children. She is a regular performer on renowned Madrid stages and in 2015 was runner-up in the National Alegrías competition at the famous La Perla de Cadiz. Maria is also a talented teacher. She is employed by the music school Educo-Musico as advisor on the professional development of dance teachers and is responsible for dance at the music school Aula-Sonora in Madrid. David's personal style is complex, ranging from lyrical delicacy to a driving intensity, characteristic of the best Flamenco guitar. His inventiveness and skill make him a great accompanist, as well as a thrilling soloist. He is an experienced and inspiring teacher who gives masterclasses and workshops in the UK and runs his own Flamenco guitar school in San Fernando, Cadiz. Jesús, from San Fernando, Cadiz, was born in to a traditional Flamenco family where his talent was apparent from a young age. He went on to study with leading teachers in his area, absorbing the work of Flamenco ‘greats’, especially the legendary ‘Camarón de la Isla’ as he defined his own unforgettable style. Performing in an impressive range of genres, he has won numerous prizes and awards in Andalusia, most recently in the Camarón de la Isla Memorial competition and the prestigious National Competition of Three Songs in Madrid and has shared stages with some of Flamenco's leading performers. He is a singer of character with a powerful, poignant voice and a comprehensive knowledge of Flamenco style, particularly the songs of his native Cadiz. He can equally perform solos, work in a group or accompany dance, and has performed in Morocco, Japan, Switzerland, Germany, Turkey, England, Ireland, India and the United States, as well as some of the most renowned theatres of Spain. In August 2015, he released his first recording 'La Voz de Mi Alma' (The Voice of my Soul) to both critical and commercial acclaim.